Is it possible for you to live in the Joy of Christ all month long? Well you can fix that right here and now! Because the truth is…you can only change yourself – but I suspect you already know that! Let this Christmas season be a season of joy for you. Other’s may not see the joy of this season, but you can bask in the inner joy of Christ and spread it to others you encounter. And that, my friends, is what the Good News is all about. That’s why we CHALLENGE YOU to make December a month of joy! And we have some goodies and freebies to help you feel the joy this season! All you have to do is hook us up with an email and we’ll send the following resources right to your inbox! Below are some resources and information on how to sign up and get your goodies! The challenge includes four FREE tools to help you out! 1.) 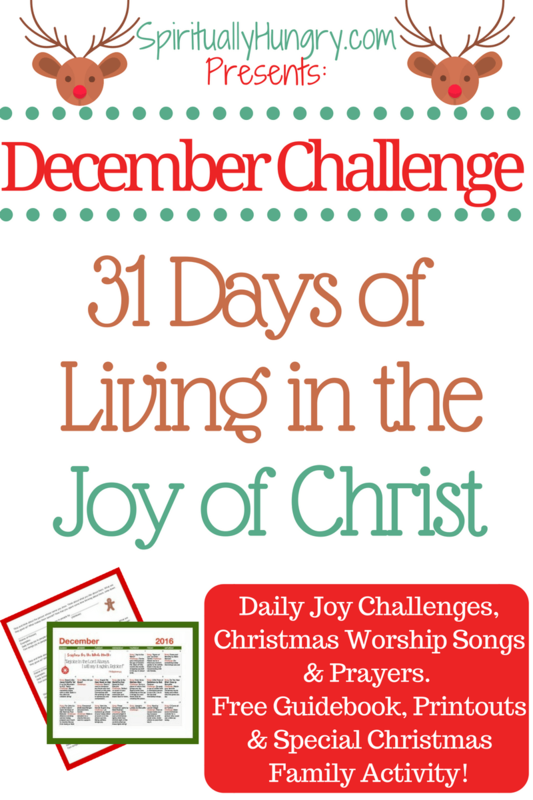 The 31 Day Joy Challenge Guidebook – We’ll tell you more about this one below! 2.) Freebie Fridays – Freebies to keep you on track with your challenge. We publish great free resources to enhance your challenge, such as coloring sheets, e-workbooks, quizzes, and much more! 3.) A Special Christmas Activity – We designed an easy and fun activity for you to do with your friends and family and help them spread joy this Christmas! 4.) Weekly Updates – We’ll send you help with the Joy Challenge each week, as well as let you know about articles we are posting along the way on the themes of Christmas and joy. Ok, feeling the joy yet? I hope so, because we’ve been really excited to put all of this together for you. 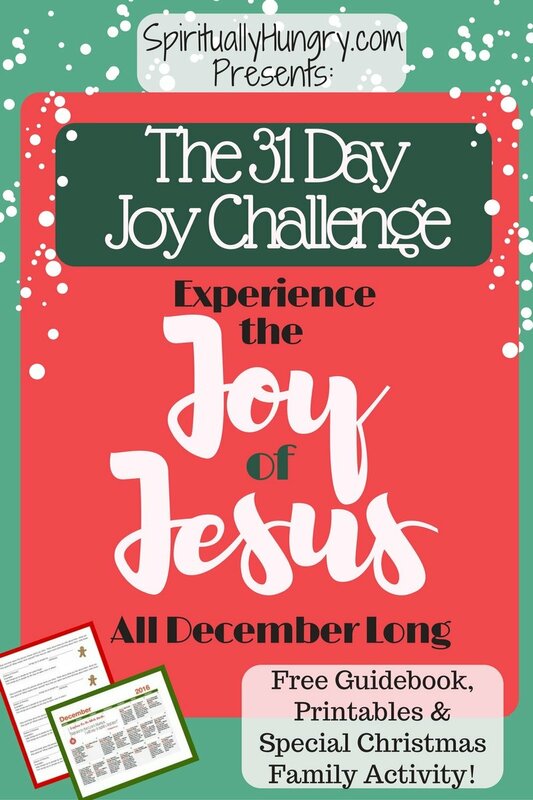 In fact, let’s go back to The 31 Day Joy Challenge Guidebook to give you an idea of what all of this really looks like. A Daily Christmas Worship Song – All of them you can easily listen to for free online. We personally designed this guidebook with these daily features to help you center your mind, heart and actions on the Joy of the Season. Challenge: Drive around tonight and look at houses decorated with Christmas lights. While doing so, reflect on how Christ is the light of the world, and think about the joy people want to share with the world by decorating their houses. Prayer: Lord, You are the light of the world. You bring so much brightness to the darkness. Help me to see how much You really do change things in this world. You didn’t just die so that I could be with you in Heaven, but you died and rose so that I might walk with You here and now! This is an amazing gift, one I often forget about and don’t fully understand. Jesus, You change things, You change me, and I am so very thankful. Help me to live in this joy. Amen. Our vision is that these tools we have provided, will help you grow and live in the joy of the season. Merry Christmas everyone! We wish you a season full of the joy of Christ living inside you and through you! Infuse this world with His light, love and joy! Don’t forget to join our Facebook group. We provide daily encouragement to help you stay on track!